Until about a week ago, the only tuna ever prepared at the MHK was the kind that comes in a can with some misnomer about a chicken named Charlie Tuna or something like that (actually only Mrs. MHK has made that). 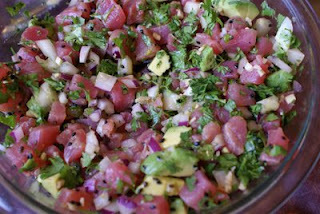 But we love tuna in restaurants, especially raw as in sushi or a tartare. So recently we came across a couple of tuna recipes that sounded great, so we gave them a shot. We were disappointed with both, but I don’t think it had to do with the recipes themselves – it had to do with the quality of the tuna. It seems restaurants get a much better tuna than our local supermarket does. You can tell just by the smell – ours smelled a little fishy, and that comes from not being super fresh. Plus it wasn’t nearly as tender as you find in restaurants. The dishes otherwise tasted good. The first was a seared tuna with Bajan seasoning – Bajan, apparently, refers to the type of cuisine found in Barbados…who knew? But as you can see from the recipe, the flavors were really nice – garlic, jalapeno, shallots, and fresh herbs made for a nicely balanced marinade. Had the tuna been of better quality, it would have been a knockout dish. The other recipe we tried was from the awesome Sriracha Cookbook for Turned-Up Tuna Tartare. With heat from the Sriracha and wasabi powder balanced with citrus from grapefruit, plus shallots and green onions, the marinade was delicious. But again, the raw tuna cubes just didn’t do it for me…slicing them thinly may have helped a bit, but I really think it’s the freshness and sub-sushi grade of the tuna that is very discouraging. But that’s why we do what we do – always trying new things, and we always will. And you’ll have to hear about it. Enjoy. I'm Hungry - Sign Me Up! Shop the Mouse House Kitchen! We Don’t Just Squeak, We Tweet! Take an Interest in Pinterest!